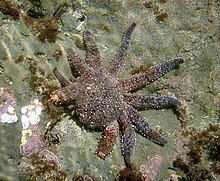 Baineann liosta na n-orduithe Echinodermata leis na ranganna agus orduithe éagsúla ina rangaíonn na tacsanomaithe na thart ar 7000 speiceas atá fós beo, chomh maith leis na speiceas de chuid an fhílim eisiaigh mara Echinodermata, atá imithe in éag. Níl aon orduithe ar eolas, ach is eol 13 go 15 genera. Níl aon orduithe ar eolas. Níl aon orduithe ar eolas, ceithre ghéineas lena n-áirítear Cothurnocystis. Tugadh an leathanach seo cothrom le dáta an 23 Nollaig 2015 ag 20:26.